IIHS Top Safety Pick. Only 42,714 Miles! Scores 37 Highway MPG and 26 City MPG! 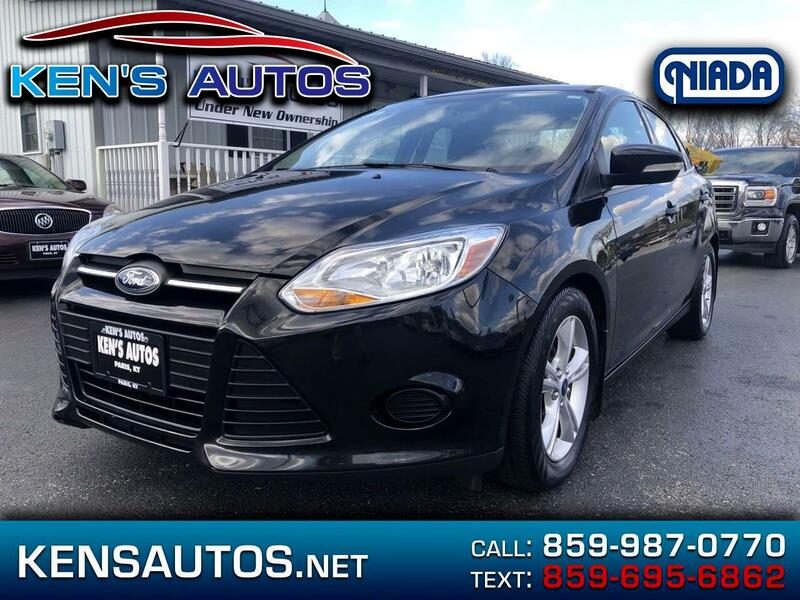 This Ford Focus boasts a Regular Unleaded I-4 2.0 L/122 engine powering this Automatic transmission. Wheels: 16 Painted Aluminum Alloy, Variable Intermittent Wipers, Urethane Gear Shift Knob. * This Ford Focus Features the Following Options *Trunk Rear Cargo Access, Trip computer, Transmission: 5-Speed Manual, Tires: 16, Systems Monitor, SYNC Communications & Entertainment System -inc: 911 Assist, VHR, SYNC Services, AppLink, Bluetooth, steering wheel controls, USB port and auxiliary input jack, Strut Front Suspension w/Coil Springs, Streaming Audio, Steel Spare Wheel, Single Stainless Steel Exhaust. * This Ford Focus is a Superstar! *IIHS Top Safety Pick, KBB.com Brand Image Awards. * Expert Reviews! *As reported by KBB.com: Want an efficient compact sedan with style, efficiency, technology and comfort that's still fun to drive? Give the 2014 Focus your close attention. * Visit Us Today *Stop by Kens Autos located at 1801 Main Street, Paris, KY 40361 for a quick visit and a great vehicle!